Running targets in "FAKE - F# Make"
The option -lt stands for "list targets". It is an abbreviation of the option --listTargets. trace " --- Cleaning stuff --- "
trace " --- Building the app --- "
trace " --- Deploying app --- "
Final targets can be used for TearDown functionality. These targets will be executed even if the build fails but have to be activated via ActivateFinalTarget(). Build failure targets can be used to execute tasks after a build failure. These targets will be executed only after a build failure but have to be activated via ActivateBuildFailureTarget(). FAKE can output the graph of target dependencies in the DOT format, which can then be rendered to a PNG-file by Graphviz. ==> "WebPackage" <=> "AdminPackage" <=> "WebApiPackage"
Since multithreading is beneficial (especially for large projects) FAKE allows to specify the number of threads used for traversing the dependency tree. This option of course only affects independent targets whereas dependent targets will still be exectued in order. Note that the dependency tree will be traversed as usual whenever setting parallel-jobs to a value <= 1 or omiting it entirely. Running targets in parallel is of course only possible when the target-functions themselves are thread-safe. Parallel execution may also cause races on stdout and build-logs may therefore be quite obfuscated. This is in addition to that that MSBuild may use multiple threads when building one solution having multiple independent project-files. "FAKE - F# Make" is intended to be an extensible build framework and therefor it should be as easy as possible to create custom tasks. 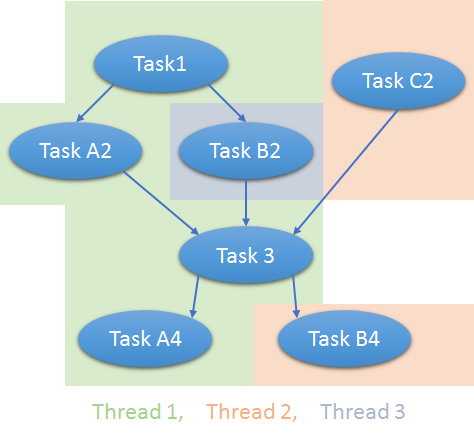 This tutorial shows how to create a (very simple) custom task in C#. If you want to use FAKE's standard functionality (like globbing) within your CustomTask project, just reference FakeLib.dll and explore the FAKE namespace. Typically you will define dependencies among your targets using the ==> and <== operators, and these dependencies define the order in which the targets are executed during a build. With this soft dependency, running B will not require that A be run first. However it does mean that if A is run (due to other dependencies) it must be run before B. // Make sure "Clean" happens before "Build", if "Clean" is executed during a build.